The Columbia 45 was one of two center cockpit motorsailors. The other was the Columbia 41. 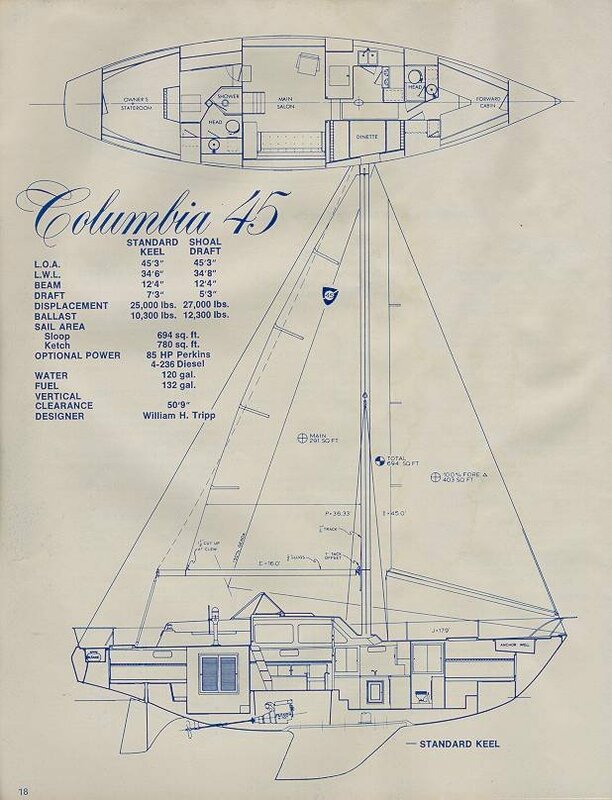 The Columbia 45 was available with either a full keel or a shoal draft keel. 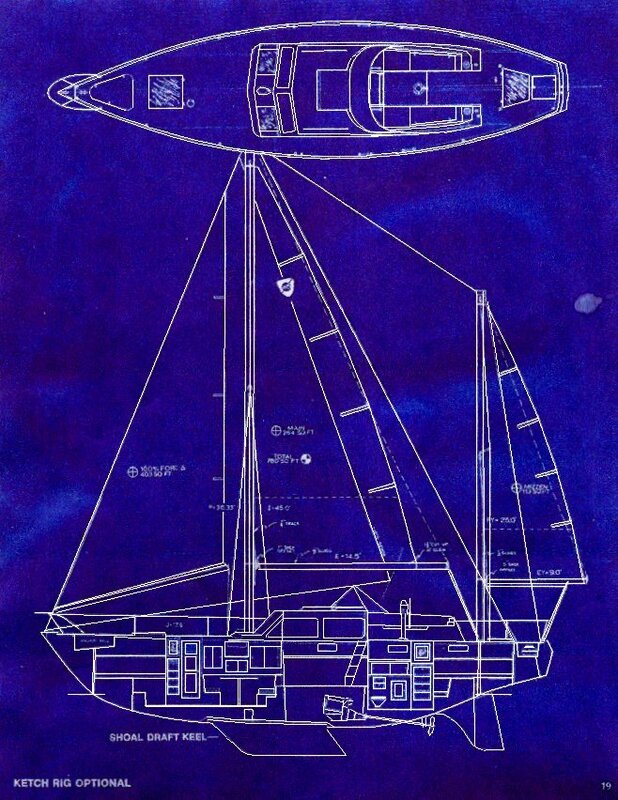 Both sloop and ketch sail plans were available. Columbia 45 standard keel sloop. Columbia 45 shoal draft ketch. A separate, independent helm in the salon was an option installed on a few boats. Here is a picture of the salon on Tardis. You can see the helm station. The wheel is removed while in port. DISPLACEMENT    25,000 lbs        27,000 lbs. BALLAST         10,300 lbs        12,300 lbs. The standard original prop on the Columbia 45 was a 20" X 13 pitch LH three blade . The standard engine was a Perkins 4-107 (45 hp) or 4-108. (50 hp). The optional engine was a Perkins 4-236 (85 hp). The std prop on the 85 was a 13" pitch or an optional 14" pitch. A few of the last 45's built had an optional 6 cyl (100 hp) Chrysler Nissan diesel. I think that happened because of a shortage of Perkin's. They all used a 1 1/4" shaft. Our 45 has the 85 hp Perkins. When we got it, it had a 13" pitch prop. Coming down the California coast last April, we motorsailed with just the 150% genoa & averaged 9 to 13 kts. Ran the engine at about 2/3rds max RPM. (tach broken) When we hauled out last August, I changed to a 14" pitch prop. So far, it almost seems to be a little too much pitch. We haven't run it very much since then so I'm still a little undecided about it's performance. Doug also tells how to remove a fuel tank. The iron keel is fastened to the hull by steel bolts that go through the fiberglass hull first, then through the plywood sandwich, then through more fiberglass and is braced on the inside by a steel channel bedded onto the hull by marine putty. Then the nuts are attached with more putty. I have hull number 29 of 150 out of the Portsmouth, Va. plant. It was built in 1971-72 actually as a 1972 model sold at the Annapolis Boat Show. This plywood panel which runs the length of the keel and is about 2ft. wide, is the only wood in the entire hull. Hi, I own a C45, 1972, out of Costa Mesa. I believe what you say is correct except for the putty stuff. What was used was a marine grade epoxy that glued the hull to the keel. It is almost impossible to remove without destruction of the hull. 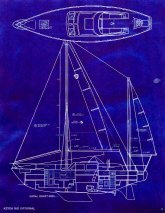 I do not know of any keel to hull separation for a C45, either intentional or accidental. We have owned Ichi, a Columbia 45 hull number 150 since 1993. 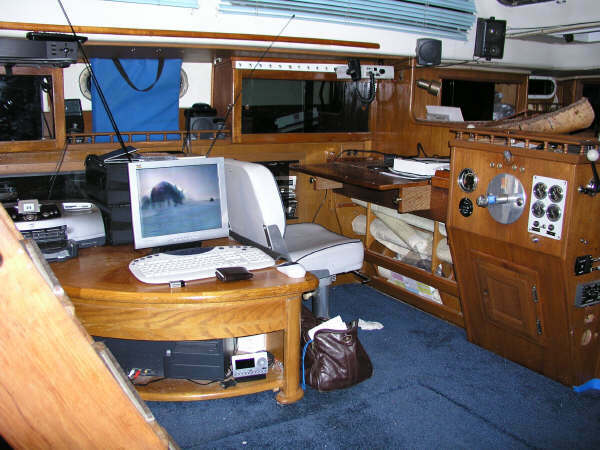 We lived aboard from 1994 until Dec 2000 and sailed her from Florida, around the Carribean and across the Pacific. She is now in dry storage in a boatyard just north of Brisbane Australia as we build up our funds to go out again! 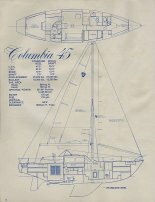 I know of two other Columbia 45's in Australia, both sailed there and imported so they are now registered in Australia. By the way, Ichi has proven to be one of the best "bluewater" boats around, rather slow but TOUGH! We lost the forestay 200 miles out of Australia in 30 knot winds and went almost 4 hours before we could rig an emergency forestay that stayed up. The mast and cabin sustained NO damage! We lost the roller furling unit and the headsail, but felt really lucky that was all that happened. Ichi has been an extremely "dry" boat, we have NEVER had a wave in the cockpit, only spray even with 10ft of "blue water" over the bow! We have had a "pooping" (following) wave that was over 60 degrees up from the helmsman's seat and the stern just rose over it! The stern did go underwater that time, but it never got as far as the cockpit.